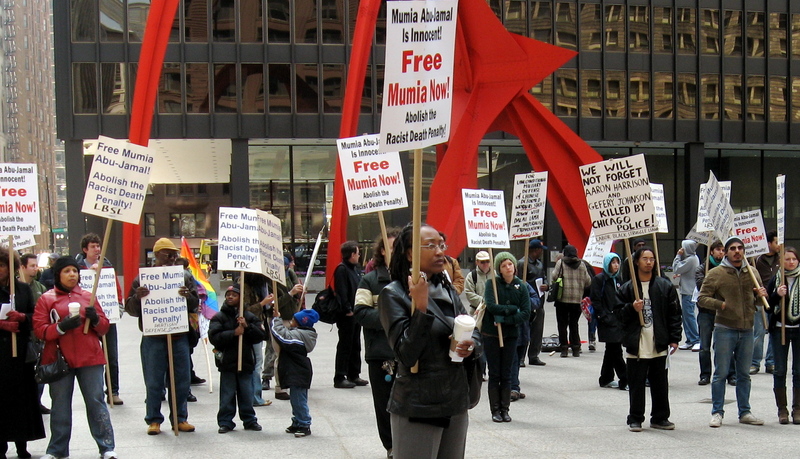 CHICAGO—On Saturday, April 26, over 200 trade unionists, students, socialists, black nationalists, death penalty abolitionists and anti-racist activists rallied at Chicago’s federal plaza to demand immediate freedom for death row political prisoner Mumia Abu-Jamal. The Chicago rally, and a rally the same day in Los Angeles that drew over 100, concluded a series of united-front protests around the world initiated by the Partisan Defense Committee and Labor Black Leagues in the U.S. and the PDC’s fraternal defense organizations, as part of an international campaign to free Mumia that was heavily built by the Spartacist League. From April 19 to 26, united front protests were held in Oakland, Toronto, Mexico City, London, and Sydney, Australia. The PDC also built class-struggle contingents for an April 19 demonstration initiated by the International Concerned Family and Friends of Mumia Abu-Jamal in Philadelphia, and for rallies in Paris on April 19 and Berlin on April 12. These protests were called in response to the March 27 U.S. Third Circuit Court of Appeals decision upholding Mumia’s frame-up conviction. The PDC-initiated united front protests—under the slogans “Mumia Abu-Jamal Is Innocent! Free Mumia Now! Abolish the Racist Death Penalty!”—won endorsements from over 300 individuals, organizations and trade unions representing hundreds of thousands of workers, including Amalgamated Transit Union Locals 241 and 308, UAW Local 3212 and AFSCME Local 3506 in Chicago. The thirteen speakers at the Chicago protest represented a broad diversity of political and union organizations united in fighting for Mumia’s freedom on the basis that he is an innocent man. Students mobilized for the protest from campuses across Chicago, including from University of Illinois at Chicago, University of Chicago, DePaul University, Chicago State University, and Northeastern University, as well as from Waukegan, Illinois and Michigan. Campus endorsers included the Black Student Union at DePaul, MEChA and Students for a Democratic Society at University of Chicago, and UIC professors David Stovall and William Ayers. “We in the Spartacus Youth Club have been going from campus to campus,” said Tom Allegri of the SYC. “We’re going around the campuses and we’re mobilizing students and radical youth behind the power of labor to demand Mumia’s freedom.” Allegri criticized reformist socialists like the Revolutionary Communist Party, International Socialist Organization, Party for Socialism and Liberation (PSL) and Workers World Party which demobilized the movement defending Mumia by preaching reliance on the “justice” of the capitalist courts: “With Mumia’s case, the reformists build faith in the capitalist system, as expressed in their calls for a new, fair trial. Contrary to these deadly illusions, we have always said that the state is not neutral!” Some individuals from the League for a Revolutionary Party, the Campaign to End the Death Penalty and the PSL attended the Chicago protest, although these groups did not endorse it. The rally provided a powerful platform linking the fight for Mumia’s freedom to broader struggles against capitalist state repression, oppression and exploitation. “Mumia’s case represents three important struggles of this century—the struggle to abolish the racist death machine; the struggle to combat police corruption and police violence, the kind of activities that we saw in New York in Sean Bell’s case, that struggle is still going on; thirdly, the struggle to free political prisoners,” said civil rights attorney Stan Willis. “Mumia’s case is so important because it embodies all of those.” Exonerated former death row prisoner Delbert Tibbs endorsed and attended the protest in Chicago. 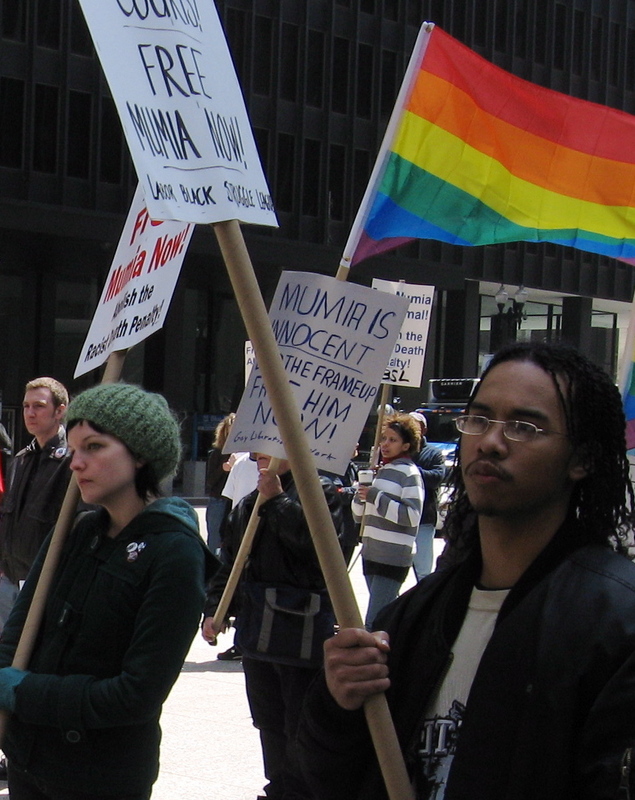 Schwartz of the GLN pointed to the connections between the fight for gay rights and the struggles against black oppression and women’s oppression, noting that Mumia has supported the cause of gay rights. Rally participants were urged to take up defense of GLN co-founder Andy Thayer, an endorser of the Mumia protest, who faces bogus felony charges from a January protest against George Bush.